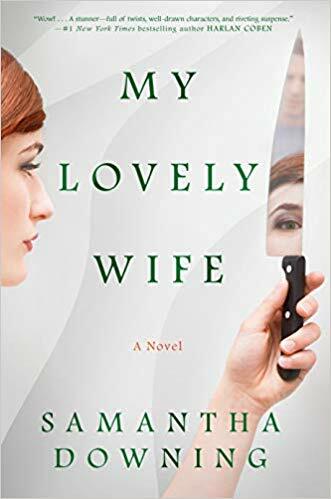 Dexter meets Mr. and Mrs. Smith in Samantha Downing’s dark and compulsive thriller, MY LOVELY WIFE. Millicent and her husband have been married for 15 years, building a normal life—by all appearances—with their two kids. What’s not quite as normal are their late night dates plotting the deaths of young women. They fell into the habit by accident, but soon enough, murder became the sizzle in their ordinary life. Stalking, lying, killing, torturing, burying bodies… what else could a healthy marriage hope for? Unfurling through the present-tense perspective of the husband, we see their relationship at play, along with their secret extracurricular activities. And as the body count begins to rise, things begin to get complicated for this husband-and-wife serial killer team. Author Samantha Downing really flips the script on this domestic suspense. The wildness of the situation is entirely absorbing, and the way she almost normalizes what is happening makes you feel surprisingly complicit. And even though we’re reading a serial killer novel, there is almost no violence in the narrative. The intrigue comes from uniqueness of the plot and the well-drawn characters that bring this sinister story to life. It all feels chilling, unsettling and increasingly tense, especially when you consider how the somewhat relatable, somewhat charming relationship of our villains is unnervingly paradoxical to the twisted reality of it. As you read it, you won’t understand why you sympathize with the husband. Why you begin to root for a murderer. Downing does such a great job of drawing you in, then pulling the foundation from under you, that you won’t know which way is up by the end. It’s the type of book that will keep you reading late into the night, with its decidedly dark yet somehow ludicrously buoyant premise. I can’t wait to see what she’ll come up with next with a debut as unique and as promising as this one.